“Resisting the Crysis” Book Review: Fighting for Space by Travis Lupick. The meeting is about to break up. But first we pause for a moment of silence to honour all those who have died from drug overdose. Everyone quietly says a name. Or lists several. Within half a minute, fifty names are quietly mumbled, ball caps and toques respectfully doffed. This is how the Vancouver Area Network of Drug Users (VANDU) meetings have ended for twenty years. 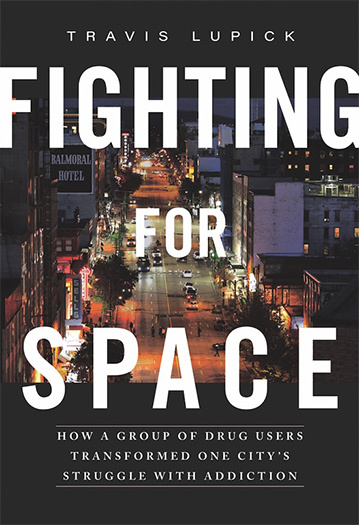 Travis Lupick’s book “Fighting for Space” traces the emergence of VANDU and other groups that have challenged the “just say no” drug war orthodoxies of recent decades. In the late 80’s and early 90’s, there was no organized movement of drug users, no safe injection site, no harm reduction, no needle distribution, no prescription heroin. Lupick tells the story of how we won those things. The book takes place on Vancouver’s Downtown Eastside, the epicentre of Canada’s fentanyl overdose crisis in which thousands have died. It’s also where some of the world’s first drug prohibition laws were conceived over a century ago. The book triggered a flood of memories from back in the day, when dirty needles were bought and sold on the street. A stingy official policy that required a one-to-one exchange made them into commodities. To get a clean rig, you had to turn in a used one first. You had to prove you were a drug user - roll up your sleeve and show your track marks. With such limited access to clean needles, HIV/AIDS spread like wildfire - reaching the highest transmission rate in the Western world. And someone died every day from strong China White heroin in the mid-’90s. As the bodies stacked up, officials were slow to respond. The core of Fighting for Space is how drug users and activists took the initiative: handing out clean needles, opening safe injection spaces on the down low and forming a drug users’ union. The book brought me back to those early demonstrations, with community organizer and poet Bud Osborn reciting his ode to the ‘hood: “Hundred Block Rock.” Activists would block traffic with an imitation syringe the size of a parade float. Or with a fleet of coffins. Or cover Oppenheimer Park with a sea of white crosses. Bud died in 2014. Lupick’s oral history is timely. The next crisis - fentanyl - is upon us. Half the people I came up with are dead from overdose. The very neighbourhood itself is disappearing too, under the creeping barrage of gentrification. The physical spaces we fought for are at risk - as are we. Last year we lost one of our strongest voices, Tracey Morrison. She knew this crisis inside and out - she spelled it “cry-sis” - but that didn’t keep her safe. Her death from overdose in July 2017 was a huge blow. After Americans, Canadians are the world’s second highest per-capita consumers of illicit and prescription opioids. We use drugs to anaesthetize ourselves from physical and psychological injuries - to blot out the trauma of colonization, the insecurity of migration, the violence of patriarchy, the brutality of racism, the ravages of disease, the boredom of work, the bleakness of poverty, industrial injuries or the anxieties of being alive in the 21st century. We temporarily patch the holes in our ruined hearts. But we are made criminals for it. As politicians talk about removing stigma, they still slap on the cuffs. We die from bad drug policy as much as bad drugs. Lupick’s book grasps the central importance of this truth. But this community knows nobody is riding in to save us. We organize our own defence. We’ve trained each other in the use of Naloxone (an overdose-reversing treatment) to keep each other alive. Learn how at www.naloxonetraining.com. Today’s crisis eclipses the last one. If it’s not already in your town, it’s coming. If you’re going to get active, read this history. If you already are, Lupick’s book helps fill in blanks and reminds us of where we’ve been. Our demands have hardly changed over the decades this book covers: stop criminalizing drug users, provides access to clean, safe drugs and don’t write policy without the input of those most affected. But we’ re not leaving our lives up to him.